Zaffranax 45 capsules order online. 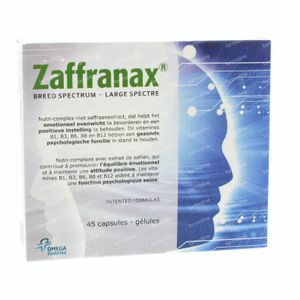 Zaffranax broad spectrum contains a standardized saffron extract that helps to promote emotional balance and to maintain a positive mood, a mental refresher for a good mood. This saffron extract supports inner peace during emotionally charged periods, ex. during major life changes. Vitamins B1, B3, B6, B8 and B12 of the vitamin B complex also help in maintaining proper functioning of the nervous system and a healthy psychological function. Zaffranax is a nutritional complex in high-quality Vcapsplus capsules offered in blisters. This allows the ingredients are well protected and can easily take the capsules. Take 1 to 2 capsules per day in the morning with a meal. Filler: microcrystalline cellulose, anti-caking agent: magnesium stearate, Standardized saffron extract (Crocus Sativus): 70 mg titrated at 2% safranal & 4% Crocin, anti-caking agent: silicon dioxide, niacinamide, cyanocobalamin, riboflavin, pyridoxine hydrochloride, thiamine hydrochloride, folic acid, biotin. V-cap: hypromellose, colors: titanium dioxide, yellow iron oxide, copper chlorophyllin complex. Preferably store it in a cool, dry place out of reach of children. A dietary supplement should not be used as a substitute for a varied and balanced diet and a healthy lifestyle. Do not exceed the recommended daily dose. Not suitable for children under 12 years. Do not use during pregnancy or breastfeeding.